Conference activities will be held in two buildings on campus. 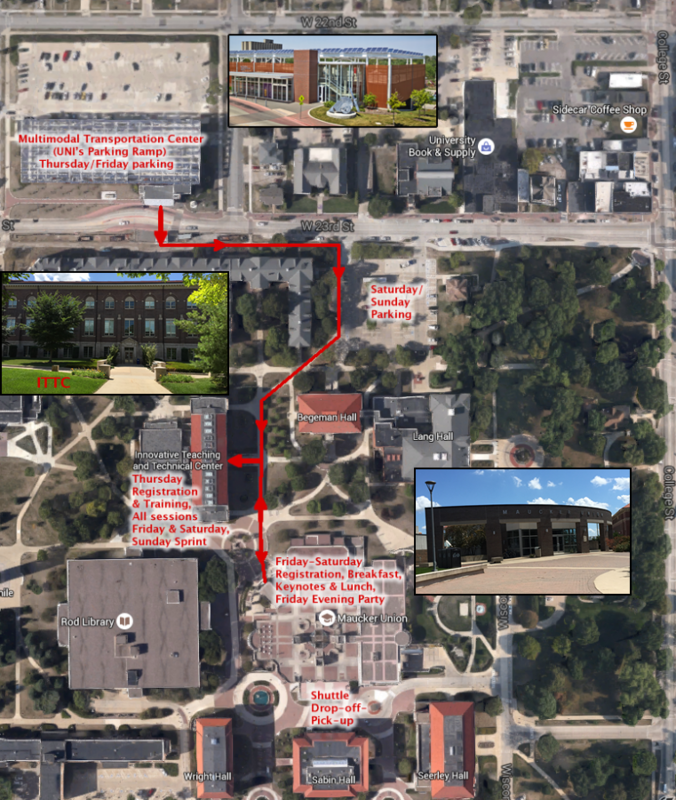 There will be signage on campus to help direct you to the conference locations. Friday/Saturday Regular Sessions 10:45 a.m. - 4:45 p.m.
Thursday/Friday parking is in the Multimoda Transportation Center parking ramp, at 23rd St. and Merner Ave. We will provide a free parking permit. A DrupalCorn volunteer will be at the parking ramp gate from 7:30 -9:30 a.m. Thursday and Friday to pass out permits to those attending DrupalCorn. Saturday/Sunday parking is permitted in the Bartlett Lot just north of Lang Hall as well as the Multimodal Transportation Facility. No permit is needed, and there is no cost on the weekend. A shuttle will run from the Country Inns and Suites Thursday-Sunday mornings and evenings, and during the party on Friday evening. The final schedule will be posted soon.